COMPETITION: Win Outlander Season 3 – the perfect Mother’s Day gift – on DVD! Celebrate Mother’s Day with the perfect gift – Outlander‘s showstopping third season on DVD and Blu Ray. Outlander is the story of time-travelling WWII nurse Claire (Catriona Balfe), who is unexpectedly transported to the 18th century Scottish Highlands. Unable to find a way home, she becomes embroiled in the local way of life and politics and soon falls in love with the dashing young soldier Jamie Fraser (Sam Heughan). The third season follows Claire and Jamie’s adventures apart after Claire returns home to her own time and husband. 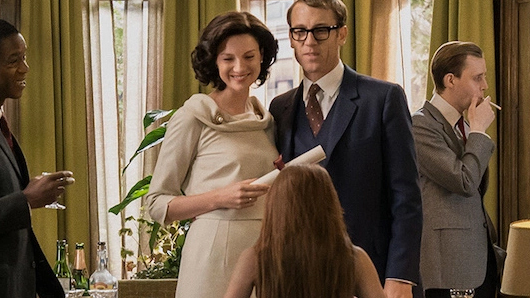 How has Claire’s absence affected her first husband, Frank, and their relationship? How will Jamie deal with the devastating aftermath of the Battle of Culloden? How will both Claire and Jamie cope with the being separated by centuries? Only one thing is for sure – love must find its way back. The DVD and Blu Ray contain all 13 episodes plus 27 deleted scenes and exclusive featurettes with the cast and crew. To whet your appetite, here’s a sneak preview of the extras, with this interview featuring series regulars stars Richard Rankin and Sophie Skelton, who play Roger Wakefield and Bree Randal. To celebrate the release of Outlander season three on DVD, we’re offering TVGuide.co.uk users the chance to win one of three DVD boxsets! This competition closes on March 26 and is only open to UK applicants. Please see full Terms and Conditions here. Outlander season three is available to buy now.